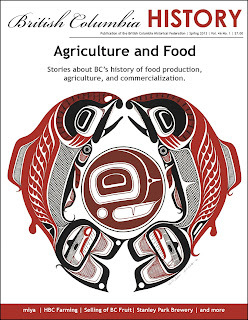 I have just signed off on the proof for the Spring issue of British Columbia History. I am very excited about the cover painting; Split Salmon, by Vancouver-based Haisla artist, Lyle Wilson and the articles that are contained within. This issue is all about agriculture, food, and beverages. In this age of supercentres and online shopping it is nice to be reminded of the farmers, early importers, ranchers, food producers, and brewers. Sit back with a beverage of your choice and perhaps some Okanagan fruit and learn a bit about British Columbia's history of food production, agriculture, and commercialization. For those that are interested in seeing more of Wilson's work. The exhibition, Paint: The Painted Works of Lyle Wilson opens at the Bill Reid Gallery on Wednesday, March 27, 2013. Lyle Wilson`s art has ancient origins in the Haisla artistic traditions and also honours how the miya (salmon) have sustained the Haisla people for generations. “The weather here has now changed at last and is now all we can desire to make hay,” writes fifty-year old Ovid Allard from Fort Langley in the midsummer of 1867.
Who brought the first Japanese orange — also known as mikan or mandarin orange — to British Columbia, and when? On the north shore of Kamloops Lake, one ranch has the distinction of having played a role in BC’s medical history. Consumer acceptance of processed food, in particular fruits and vegetables of the Okanagan Valley, came from Britton’s grassroots work between the food industry and the home. The Stanley Park Brewery has achieved a near-mythical status among those interested in Vancouver history but left many unanswered questions for brewery historians. The delicious, smoky smell created by the curing and smoking element of the food production at James Inglis Reid Ltd. is remembered by many who shopped there. The Last Retort. The Whistler Museum and Archives has digitized the newspaper that was the voice of the squatter ski bum — the Whistler Answer. Andrea Lister, grand-niece of champion plowman David B. Reid, tells the tale of how her grandfather’s winning horse plow returned to win again. Embracing the works of new writers and scholars relating to British Columbia's history.